Glaze is a glassy coating layer on pottery which is baked to beautify and preserve, and make watertight. It is an aqueous mixture of china clay, mixed with tin or lead. Silica (SiO2) is like in glass the main component. Furthermore, a metal oxide as a bonding agent, and melting agents to melt open the glaze at a suitable temperature. The binder, usually alumina (Al2O3) is found in kaolin, also known as China Clay. Glazed pieces you place in a tripod so they do not melt and stick to the floor. 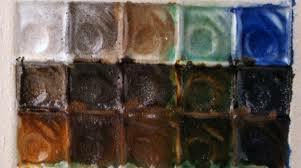 Before a glaze is known, many tests are needed.